The story of how Matuschka's controversial self-portrait landed on the cover of The New York Times Magazine and its powerful impact on the public all over the world. In this presentation the artist will familiarize the audience with her work prior to illness, her influences (Frida Kahlo/Verushka/Anna Mendieta) and the difficulties she faced with censorship and rejection during the 90s. Media Utilized: A DVD will be shown, along with projection of the artists website. 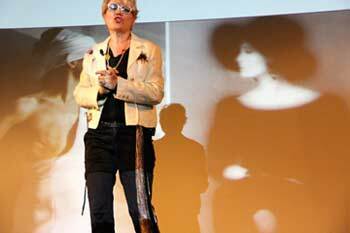 Potential AUDIENCE: Breast cancer groups, art history and art students, general public. Group Participation is encouraged via question and answer period. Type: Lecture with Visuals, Derivative: "Take Back the Night"
A discussion of self-portraiture in art history focusing on female artists. Matuschka will talk about the political, sociological and feminist implications of both her work and of other artists using their bodies as a metaphor to address social and political issues beginning in the 70s when she arrived in NYC. Brief background on how women are portrayed throughout time leading up to the present. This lecture can be combined with an art worship focusing on self-expression by "putting yourself in the picture" and making a self-portrait. 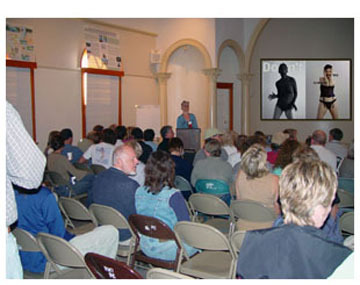 Media Utilized: A DVD, regular slides, and/or PowerPoint presentation. Opens with (DVD) then proceeds to Matuschka preferred "interview" style for presenting her story/information before an audience. This lecture proposal would involve an interviewer, such as a professor or advanced student, accompanying Matuschka on stage in a "chair to chair" sort of discussion. Interviewer will ask Matuschka questions in an informal setting, also encouraging students to participate with questions themselves. Photos will be shown, either though website projection or other means. Potential AUDIENCE: students, general public.Group Participation is encouraged via question and answer period. All talks can be accompanied by a DVD including television appearances and are followed by a Q & A session with open discussion. Matuschka is available for a variety of art workshops. Group size varies. Wide age range. Portfolio Review: group size 10-12. Matuschka will evaluate studentÕs work in front of the class. Matuschka will point out the strengths in each work, discuss areas which may be reconsidered, restructured or improved and encourage the student to find his or her own solutions. Poster Making Workshop: Matuschka will show a variety of posters, including her award winning ones, which combine visuals with text. The class will be given an assignment to create at least one, if not two posters addressing issues that are personal, political, or of interest to them. BAGIT: open workshop for a wide age range. Matuschka will show several published books on shopping bags, including her own and encourage participants to create their own bags by using recycled and new/raw materials. This workshop may be open to all age groups and given at different times. Age ability will dictate media, i.e. sewing, printing images on bags, or gluing and pasting. Artist in Residence: Matuschka can be available in a studio workshop whereby she will create new work while interfacing with students in a creative setting, whereby they will be encouraged to present work for her review, or work alongside her. The artist may also act in an advisory capacity for one on one student exchange and serve as a mentor. 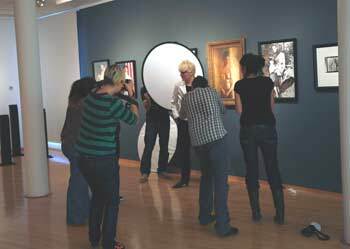 Self-Portrait Workshop: group size 10-12. Focus on self-expression by putting oneself in the picture and creating a self-portrait. Art Students of mixed media are encouraged to participate. In this class, Matuschka will show a variety of works by herself and other artists and assign students a challenging expression in self-portraiture based on a specific issue in their lives. Price varies depending on location and sponsoring organization. 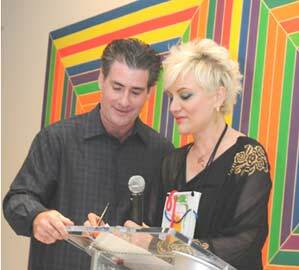 The artist works in tandem with non-profits and schools when establishing price structure. Please note: All travel, including car-fare to and from airports, airline tickets, hotel, and per diem (for food and local transport) must be paid by the sponsoring organization. This is in addition to lecture and workshop fees. Additional terms: (non refundable) one half of established fee paid in advance upon signing contract.